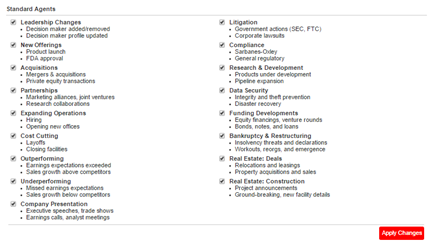 InsideView provides 18 built-in categories of Agents (sales trigger events). Some of these categories may not apply to your particular business. To avoid information overload, it’s a good idea to turn off any Agents that aren’t of interest to you. That will make it easier to find the key Company Insights most likely to help you find and close more business. 1 Manage agent settings Click the Manage Agents link from the Home page, or select Settings and then Manage Agents. 2 Unselect the check box Uncheck the check boxes of any Agents that aren’t relevant to your business. 3 Apply Changes Click Apply Changes.